It’s probably not fair to be rating this as it’s an animated film in a different language. But I’ve noticed something about animated films in a different language, and it’s that the acting seems much more mechanical and clunky. And this one wasn’t any different. Also, and this is a problem specific with Japanese animated films, the children are always incredibly loud and obnoxious. The animation really is beautiful in this film, but I have never been a fan of minimalist animation. It seems lazy and unfinished to me. Plus, I don’t like the jagged chaos of Japanese animation (ie, when Princess Kaguya is running away from her would-be suitors). Now I really, really loved the musical score, especially the song that the moon people played when they were coming to collect Princess Kaguya at the end. A bamboo cutter finds a sprite in a bamboo stalk and together, with his wife, raises her as their daughter. But a village life is not good enough for their daughter. So, using gold and the finest cloths (that were also found in bamboo stalks) he builds his daughter a palace in the capital. He then plots to marry her off to any of the wealthiest and most powerful men in the kingdom. 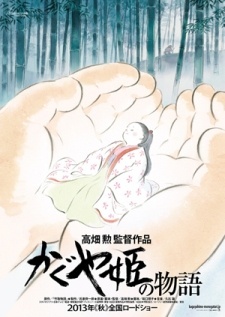 However, Princess Kaguya refuses them all, because they see her as only an object. Finally, when the Emperor himself demands her hand in marriage (but really to be one of his many concubines), she refuses him as well. But the Emperor won’t take “No” for an answer and imposes himself up her, embracing her. At that moment, she pleas to the moon people to take her back. And so they do, though then she realises that she doesn’t want to leave. At first, I thought that this was a film about a woman standing up against a patriarchal society, and that it was a lesson to men to not treat women as objects. However, the tagline of this film is “A Princess’s Crime and Punishment”. What exactly was her crime? Her punishment is obviously being taken back by the moon people, but what exactly was her crime? Refusing men left and right, because she didn’t want to be objectified. That is what her crime was. So, the moral of this story turns out not to be about teaching boys not to objectify women, but rather teaching girls that they must, by law, obey men. There’s no reason this needed to be two hours long, especially since it took an hour to even get anywhere. It didn’t really seem to be too grandiose.